A chemist in the environment is another in a series of YouTube videos produced by Ordre des chimistes du Québec (OCQ). It offers a glimpse of the work chemists do in monitoring the environment for natural and synthetic chemicals and highlights the role chemists play in assuring water and air quality. It is now time to act! The deadline for renewing your membership in the ACPBC is January 29, 2016. The ACPBC is pressing to enhance the professional stature of chemists through recognition of the profession of chemist in BC through legislation and in regulation. The ACPBC is also deeply involved with the national umbrella organization FCPC – Federation of Canada’s Professional Chemists/ Federation des Chimistes Professionels du Canada. These are important steps for our profession in BC and nationally. We look forward to your continued support. Soon. We are pleased to announce that the winner of the 2015 ACPBC Undergraduate Scholarship is Ms. Sydney Acton. Ms. Acton is fourth year Honours Chemistry student at UBC Okanagan. In addition to her studies she is active in the UBCO Chemistry Course Union and in the CIC South Eastern BC local section. Congratulations to Sydney, and to the other applicants for the scholarship! Full details on the scholarship and biographical sketches of past winners are on our Awards and Sponsorships page. Emily’s Story – a chemist in research in development is the first of a series of YouTube videos produced by Ordre des chimistes du Québec (OCQ). It offers a glimpse of the work chemists do in creating new pharmaceuticals and also tells one chemist’s story of what motivated her to engage in the profession. Are you planning to be in Calgary November 9th and 10th? If so, you may want to check out this short course. Within the scope of the CPIC study called “The Impact of Photonics on the Canadian Economy-Review and Prospects », we are organizing a FREE workshop on Photonics for the Natural Resources Sector. The objective of this workshop is to discuss the business and technology trends of the natural resources sector (mining, forestry, etc…) as well as the photonics sector and to proceed with a SWOT (Strengths, Weaknesses, Opportunities and Threats) analysis of photonics for the natural resources sector thereby identifying the required improvements and investments to ensure Canadian economic growth. If you are unable to attend the AGM in person you will be able to participate via a web conference. To set this up you must contact Tom Fyles at registrar@pchembc.ca by noon October 20 so that an invitation with a connection link can be sent. This year’s Professional Development workshop is “Professional Ethics for Chemists”. It will be held from 08:00 to 16:30 on October 23 and will focus on “Professionalism in Chemistry”. This engaging one-day course provides an introduction to the ethical framework that guides professional chemists. The course focuses on solving practical issues that arise in professional practice and in the workplace by working through case studies in a facilitated group discussion. An examination based on a case study will be given at the end of the day. Candidates that pass the exam will receive an Ethics certificate. Completion of the course is an asset to enhance your professional credentials, for those considering management activities in the workplace, and for your employer to have someone holding the certification. 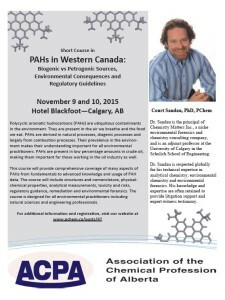 To register, please go to https://pchembc.ca/professional-ethics-for-chemists/. The 2015 ACPBC Undergraduate Student Scholarship, in the amount of $1000, is awarded to an ACPBC student member enrolled in third or fourth year of an undergraduate Chemistry program at a British Columbia university. All applicants should be student members of the ACPBC. The award is equally based on academic performance in all completed Chemistry courses and service to the Chemistry profession. Full details on how to apply are available here. In conjunction with the ACPA we are pleased to offer the one-day course “Professional Ethics for Chemists”. The course has been rewritten for our Code of Ethics and focuses on solving practical issues that arise in professional practice. After a full morning of presentations by two instructors, Nils Petersen and Kathy Janzen, and several case studies examining issues that arise in everyday work situations, an examination exercise based on a case study is given at the end of the day. Successful attendees are provided with a certificate of completion. The course materials include a personal copy of The Ethical Chemist: Professionalism and Ethics in Science by Jeffrey Kovac for each registrant. To allow maximum discussion and understanding of ethical management, attendance is strictly limited to 30 registrants. It is offered on a cost recovery basis and includes continental breakfast, lunch and refreshments . Further details are available – contact Tom Fyles (registrar (at) pchembc.ca). Online registration here. The AGM is open to all ACPBC members and will include the business of electing the Board and Officers and an update from the Association President, Paul West (pwest (at) uvic.ca). In addition to contributing to building a strong and relevant professional association for Chemists in BC, this is a great opportunity to meet fellow members, make new contacts in the profession and catch up with old friends. If you are unable to attend the AGM in person you will be able to participate via a web conference. To set this up you must contact Tom Fyles at registrar (at) pchembc.ca by noon October 20 so that an invitation with a connection link can be sent.